The submission deadline has been extended to August 25th, 2017, anywhere on Earth. 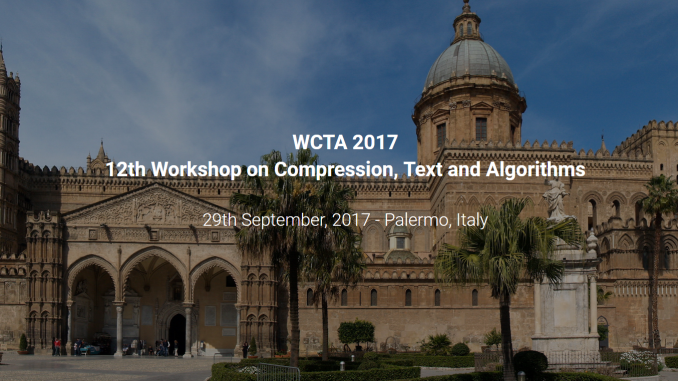 The 12th Workshop on Compression, Text and Algorithms (WCTA) will be held at Eurostars Centrale Palace in Palermo, Italy, September 29, 2017, the day after SPIRE’17. This is an annual satellite workshop of SPIRE mostly focusing on compression, data structures and string processing topics. We invite an abstract for presentation (15-25 minutes) of preferably unpublished work, published results, work in progress, surveys of interest, open problems, etc. Since WCTA has no proceedings, it will not preclude a possibility of submitting presenting results to other conferences or publishing them in journals. We particularly encourage submissions from junior members of our community. WCTA will be free for all attendees. Please submit abstracts by emailing copies (preferably PDF) to both WCTA co-chairs (addresses below). WCTA will feature two invited talks on “Engineering meets Biomedicine” by Knut Reinert from Freie Universität Berlin and “(Quasi) Succinct Data Structures and Information Retrieval” by Sebastiano Vigna from Università degli Studi di Milano. BIRDS Project: Bioinformatics and Information Retrieval Data Structures Analysis and Design.